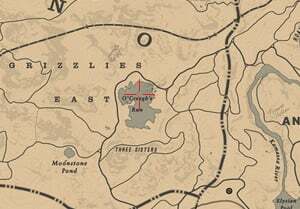 All That Glitters is a Stranger Mission in Red Dead Redemption 2 (RDR2). Stranger Missions are the equivalent of Side Quests, and they unlock as you progress the Story Missions. 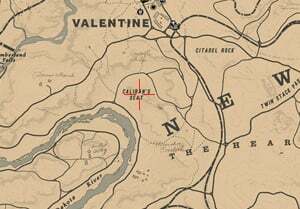 This is a side questline to Treasure Hunt (Treasure Maps): Jack Hall Gang. To begin this mission, you need to purchase the map from Máximo Cristóbal Valdespino for $10, bargain down to $5 or steal it from him. If you accidentally kill him, you can purchase the map from any fence in the game. 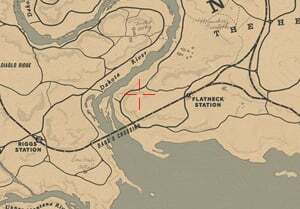 Treasures in Red Dead Redemption 2 are a selection of items hidden around the world, that can be found via a treasure map or instructions. You will be able to ride to the top when heading towards Caliban’s Seat from the North. At the top, go down to the right and continue along the narrow cliff. The treasure map is inside a small gap in the wall. From the pile of rocks, find the larger rock on top. Approach the Lake O’Creagh’s Run in Grizzles East. 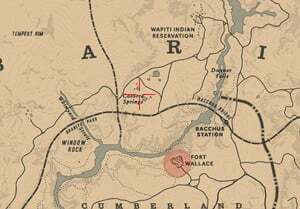 You will find two gold bars are located on the south side of the island.